The trillion dollar question: will renewables push out natural gas? Can the price of batteries continue to go down? Bloomberg’s renewable energy affiliate forecasts that wind and solar power will make major inroads into the global market share of natural gas within a decade. This is a crucially important question for major oil companies who are betting their future on gas, writes Managing Director of independent US-based consultancy GSW Strategy Group Geoffrey Styles. But according to Styles, it is likelier that coal, not gas, faces the biggest risk from the growth of renewables. A recent story on Bloomberg News, “What If Big Oil’s Bet on Gas Is Wrong?”, challenges the conventional wisdom that demand for natural gas will grow as it displaces coal and facilitates the growth of renewable energy sources like wind and solar power. Instead, the forecast highlighted in the article envisions gas’s global share of electricity dropping from 23% to 16% by 2040 as renewables shoot past it. So much for gas as the “bridge to the future” if that proves accurate. It’s also worth noting that the US Energy Information Administration projected in February that natural gas would continue to gain market share [in the U.S., even in the absence of the EPA’s Clean Power Plan, which is being withdrawn. But it’s not clear that the factors that have kept gas expensive in Europe and protected coal, even as nuclear power was being phased out in Germany, will persist. The US now exports more liquefied natural gas (LNG) than it imports. US LNG exports to Europe may not push out much Russian gas, but along with expanding global LNG capacity they are forcing Gazprom, Russia’s main gas producer and exporter, to become more competitive. Then there’s the issue of flexibility versus intermittency. Wind and solar power are not flexible; without batteries or other storage they are at the mercy of daily, seasonal or random variation of sunlight and breezes, and in need of back-up from truly flexible sources. Large-scale hydroelectric capacity, which makes up 75% of today’s global renewable generation and is capable of supplying either 24×7 “baseload” electricity or ramping up and down as needed, has provided much of the back-up for wind and solar in Europe, but is unlikely to grow rapidly in the future. BNEF may be relying on the same aggressive forecast of falling battery prices that underpinned its recent projection that electric vehicles (EVs) will account for more than half of all new cars by 2040. As the Financial Times noted this week, battery improvements depend on chemistry, not semiconductor electronics. Assuming their costs can continue to fall like those for solar cells looks questionable. Nor is cost–parity a function of temporary government incentives – the only aspect of performance that will determine how well EVs compete with steadily improving conventional cars and hybrids. I also compared the BNEF gas forecast to the International Energy Agency’s most recent World Energy Outlook, incorporating the national commitments in the Paris climate agreement. The IEA projected that renewables would reach 37% of global power generation by 2040, or roughly half the increase BNEF anticipates. The IEA also saw global gas demand growing by 50%, passing coal by 2040. That’s a very different outcome than the one BNEF expects. Despite my misgivings about its assumptions and conclusions, the BNEF forecast is a useful scenario for investors and energy companies to consider. With oil prices stuck in low gear and future oil demand highly uncertain, thanks to environmental regulation and electric and autonomous vehicle technologies, many large resource companies have increased their focus on natural gas. Some, like Shell and Total, invested to produce more gas than oil, predicated on gas’s expected role as the lowest-emitting fossil fuel in a decarbonizing world. If that bet turned out to be wrong, many billions of dollars of asset value would be at risk. However, it’s hard to view that as the likeliest scenario. Consider a simple reality check: As renewable electricity generation grows to mainstream scale, it must displace something. Is that likelier to be relatively inflexible coal generation, with its high emissions of both greenhouse gases and local pollutants, or flexible, lower-emitting natural gas power generation that offers integration synergies with renewables? The US experience so far says that baseload facilities – coal and nuclear – are challenged much more by gas and renewables, than gas-fired power is by renewables plus coal. The bottom line is that the world gets 80% of the energy we use from oil, gas and coal. Today’s renewable energy technology isn’t up to replacing all of these at the same time, without a much heavier lift from batteries than the latter seem capable of absent a real breakthrough. If the energy transition now underway is indeed being driven by emissions and cleaner air, then it’s coal, not gas, that faces the biggest obstacles. 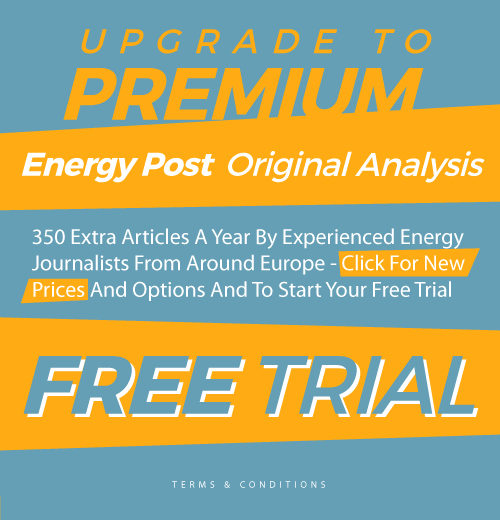 This article was first published on Geoffrey Styles’ blog Energy Outlook and an our US-based sister website The Energy Collective and is republished here with permission. A few comments: Wind and solar are VARIABLE, but not inflexible. Within the limits set by sun and wind they can operate extremely flexible, reactin within seconds (wind) or milliseconds (solar), faster than any gas or hydropower station. How much will wind and solar push out of the market in the future? Well, there seems to be a manufacturing revolution rolling in the solar sector, bringing down polisilicon consumption down from 5,5-6g/Wp to around 2g /Wp from 2015 t0 2025. Since polysilicon and ingot-capacities are still being expanded while needed material drops, this leads to forseeable 400GWp/year manufacturing caoapcity from polysilicon to wafer in 2025, or maybe more if more factories and machines are being bilt. So far polysilicon prices remain stable, and remain higher than the reported manufacturing costs, alowing a healthy economic development of the companies in this sector. Since the 400Gp/year capacity does not need new machinery (just upgrades in the wafer manufacturing of existing machines), no new factories and no new personal, besinde the existing equipment and eqipment already under construction, this means that prices up to wafer state will drop accordingly. When we assume that cell and module capacity will be expanded to fit to waer capacity, this would mean that something like 600TWh of new PV power output will be added each year to the grids, along with new wind power. It seems likely that new power production of this scale will have impact on the sales volumes of coal and natural gas. Well, even if this forecast is correct, gas will still have been a bridge to the future! This article should be about “When will renewables replace natural gas”, not “will they”. I think it very highly unlikely the world makes it to 2025 before pressure to abandon fossil fuels soars. That’s long enough for most of the ‘old fossil fuel fools’ to die off, the rate of extreme weather events to grow significantly, and sea level rise to become alarming. Governments are likely to be under a lot of pressure, both citizen and common sense, to cut FF use. In the US we currently get about 65% of our electricity from fossil fuels. Natural gas has been replacing coal but, overall, the amount of fossil fuels has been dropping. It’s not unreasonable to think the US will be replacing FF with RE at about a 3% market share in less than five years. (Wind and solar grabbed about 1.7% in 2016.) By the time we hit 3% W/S FF should be down to 60%. That means a 20 year span to kill off almost all FF use for electricity. With the rapidly falling cost of wind and solar it could happen sooner. Coal will go first because coal is so inflexible and has such high external costs. Natural gas will see more and more of its demand taken over by more RE installed and cheaper storage. NG has a better hope of hanging on longer in the US because we have inexpensive sources. Economics will put pressure on NG in many other countries. Lots of pressure will come to bear on shutting down coal as we are now seeing in China and India. Not only due to air quality problems but also due to the large amount of water used in coal processing and plants. We have many forces driving the transition to RE. So many people/organizations fail to take them all into account when they make predictions. Comments here so far seem to have forgotten that fossil fuels used for electricity production is only part of the picture. In the UK, for example, more gas is consumed for heating than in the power sector. That will remain the case for the foreseeable future. Domestic electricity costs about 4 times that of gas. Switching to electricity for heating would be far too expensive for most people in the UK. Gas worldwide has a bright future and the oil companies know this despite the renewables lobby suggesting otherwise. I can’t find a definitive source but the four sources I did find claim air source heat pumps are cheaper to operate than are gas furnaces in the US. Heat pumps have become very efficient. Resistance heating is more expensive than both. If electricity is expensive and gas cheap in the UK then heating with gas may be cheaper. But not in the US where NG is fairly cheap and electricity prices moderate. Yes – air source heat pumps, or ground source heat pumps would be needed in the UK to keep running costs down. My son is in a new build flat/apartment with an air source heat pump. The place is so well insulated though he hardly needs to run the heating. The UK’s existing housing stock is a problem though and difficult to insulate effectively. UK homes are smallish too often without the land needed for ground source heat pumps. Air source ones could be used. The heat is low grade though compared to gas so new radiators are needed too meaning completely stripping out the old gas system. Some new UK social housing has been built with heat pumps and the systems have been more expensive to operate than expected and not liked by those living there. Some have ditched the heat pumps and gone to gas. Maybe just design issues though with lack of heat pump experienced builders. Yes the problem is in germany too, that a lot of installers, who also set the parameters for the operation of the system, build and operate heat pmps like gas systems, whith water temperatures set to 60-70° C instead of 30-40°C or less, even if the design of the system is for low temperature. resulting in costs which ar 2-3 times as high as neccesary. It’s neccesary to teach people how to operate the new kind of system. At places whith low ground area also vertycal ground systems, sometimes for a whole neighbourhood, are usefull here, and especially in swizerland – they often drill many hundred meters deep, reaching significant higher temperatures by doing so. Doing this for one house would be too expensive, but toing so for 10 houses – so roughly 2x500m instead of 10x100m can make a lot of sense. Reality is, we can’t continue to burn fossil fuels. Gas heating simply has to go away and the sooner the better as with all FF use. These are the very early days of highly efficient air source heat pumps. It will take some time before the folks who install and use them get things figured out. And we probably need some better ideas about how to insulate older homes.